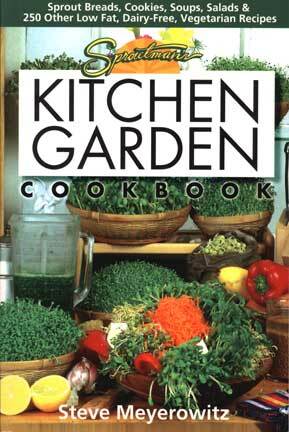 Sproutman's Kitchen Garden Cookbook: Sprout Breads, Cookies, Soups, Salads & 250 Other Low Fat, Dairy-Free, Vegetarian Recipes. The Information: Dairy--the Pros & Cons. Making Sprout Bread. Howt to Dehydrate Foods. Charts on Nutrition, Spourting, & Food Drying. Comparisons of Conventional & Whole Foods. Low Fat/Low Salt Diet. How to be a Healthy Vegetarian. Glossary of Health Foods. Complete Sprouting Guide. Low Temperature Cooking. The Recipes: All Dairyless, All Flourless, All Vegetarian. Zucchini Chips. Cashew Yoghurt. Almond Milk. Sprout Breads. Bagels & Cookies. Dairyless Vanilla Ice Cream. Basil Tahini Dressing. Salt Substitutes. Dehydrated Banana Chips. Whole-Meal Super Salads. Non-Alcoholic Rejuvelac Wine. Natural Sodas. Healthy Halvah. Sunflower Seed Cheese. Pizza Without Sin...more. Steve Meyerowitz began his journey to better health in 1975 to correct a lifetime condition of allergies and asthma. After 20 years of disappointment with orthodox medicine, he restored his health through diet and fasting. He ate 100% live foods for 5 years, practiced fruitarianism, a diet of fruit, nuts, and sprouted seeds, and fasted on raw juices for as long as 100 days. Steve was nicknamed Sproutman in 1977 because of his innovative sprouting ideas and recipes. In 1980, he founded The Sprout House, a "no-cooking" school in New York City. His inventions--the Sprout House Indoor Vegetable Kit and the Flax Sprout Bag--are sold nationwide. 322 pages.